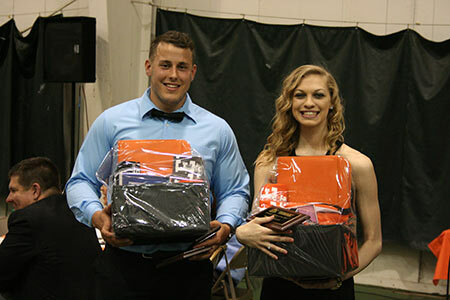 Cowley College 2016 Male and Female Athletes of the Year, Sergio Guijo and Madi Greenwood, are among the finalists for the Junior College Male and Female Athletes of the Year at the 19th annual Greater Wichita Sports Banquet on Thursday, June 30 at Century II Exhibition Hall. The banquet celebrates sports excellence in south central Kansas. Awards presented at the banquet include: High School and College Male and Female Athletes of the Year; Professional Athlete of the Year, the Johnny Bench Award presented by BaseballSavings.com and many more. Former Major League Baseball catcher Jim Sundberg, who was a three-time All-Star, six-time Gold Glove winner, and member of the 1985 World Series winning Kansas City Royals will be the evening's keynote speaker. Hall of Famer Johnny Bench will also be on hand to announce the Johnny Bench National Collegiate Catcher of the Year. Bench's career honors include: National League Rookie of the Year (1968); National League Most Valuable Player (1970, 1972); World Series Most Valuable Player (1976); 14-time All-Star and 10-time Gold Glove winner. In 1980, he set an endurance record by catching 100+ games for 13 consecutive seasons. Bench was elected to the Baseball Hall of Fame in January 1989 with the fourth highest percentage of total votes cast. As a freshman member of the Tiger track and field team, Guijo finished the year by being the national champion in the hammer throw at the NJCAA Division I Outdoor National Championships. His performance helped Cowley place 13th as a team at the national meet. He followed up that success with a strong sophomore campaign. After finishing second in the conference and third in the region at the 2016 Region VI/Jayhawk Conference Indoor Championships held at Pittsburg State University, he broke his own school record and placed third in the men's weight throw at the 2016 NJCAA Division I National Indoor Championships in Winston Salem, NC. Guijo recently won his second straight outdoor national championship in the hammer throw and earned First Team NJCAA All-American honors, helping Cowley place 14th nationally. As a sophomore guard for the Lady Tiger basketball team, Greenwood was a First-Team All-Conference selection after averaging a team-high 12.5 points and 2.6 steals per game. During the 2016 season, she helped the Lady Tigers capture its first Region VI title since 1989 as the team advanced to play at the NJCAA Division I National Tournament in Lubbock, Texas. Greenwood helped Cowley to a record of 27-8 this past season and the team won a total of 51 games during her two years at the school. After a successful two years of playing basketball at Cowley, she has signed a letter of intent to continue her basketball career at NCAA Division II Angelo State University in Texas.